It’s a sad fact that up to 140,000 tonnes of electronic waste end up in the landfills every year. This isn’t surprising when you considering how quickly some electronics become out-dated, especially cell and smartphones. Granted, many cellphones become inoperable for one reason or another and I suspect that’s why so many end up in the trash, however there are safer ways to dispose of them. Safe disposal is important because the accumulation of electronics in landfills, along with improper recycling, cause heavy metals to contaminate our water and soil and exposure to high levels of lead, cadmium and mercury are dangerous to our health. Then again, when you buy a new cellphone, the old one usually ends up in a drawer and forgotten about but what if you could get back some of the money you paid for it? 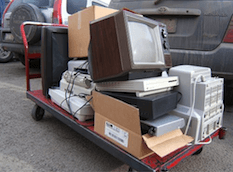 Here’s a look at a few websites that enable you to trade in your old electronics for cash and recycle broken items for free. This company deals in old cell phones, net book computers and tablets. You can earn up to $250 for recent models in good working order. Check out their price lists online to see what you could get for your device. What you actually get for your phone will depend on the condition it’s in. To send in a phone for evaluation, simply print the postage paid mailing label you’ll find online, along with a completed claim form; one for each phone or other device you’re sending. CellCycle will also accept old and broken cell phones for recycling. You can mail them in for free, as well. If you want to raise money for your charity, CellCycle will also buy cell phones by the pound, working or not. A minimum of ten pounds is required. This company accepts cellphones, MP3 players, digital cameras, tablets and camcorders. You answer four simple questions and get an instant quote for your device. Once you determine what your electronic device is worth, SellYourElectronics will mail you a shipping kit with a prepaid shipping label. After they check the device over, your payment will be processed within four days. For every item you send in, you can also send up to ten more electronics that have no value, for recycling. This works in the same way as SellYourElectronics. You simple answer four simple questions online and get an instant quote. If you decide to sell them you’re device, they’ll send you a shipping label for UPS. After they inspect your electronic, you’ll be paid by cheque or PayPal. This company is looking to buy cellphones, notebooks, MP3 players and tablets. Besides cellphones, BuyBackWorld will buy your older model headphones, video games, home audio equipment, Apple and Mac computers and a lot more. The process is the same – you answer a few questions, they provide postage for mailing and, after they inspect the device, a payment will be made to you within a week. If they disagree with the condition you judged your item to be in, they’ll send you an email with a revised offer which you can refuse or accept. If you don’t want to accept the new offer, they’ll mail your item back to you free of charge. These companies are all big on protecting the environment by making sure old electronics don’t end up in landfills. They resell them or send the unusable ones to a reputable company for proper material processing. Check each site to see which one will offer you the best price. Most of these sites say they protect your data by clearing it from your old device, but to be safe, after backing up your personal information, remove it from the device before you ship it. And don’t forget to remove the SIM card from a phone. Responsible disposal of our old electronic toys is important to our planet’s future and these websites should encourage people in that direction. After all, if you can get back even a few dollars for a cellphone or e-reader nobody’s using, it’s found money. And the market for used cellphones is booming. I just donated a used printer to a charity organization that will be turning it in for cash. After looking at one of these companies a few years ago, I really forgot things like this existed! We were talking about selling some things to make some cash, and this is a very realistic way to do that. Oh my gosh! Know a place that will buy CDs?